We are getting ever so close to the 200 liker mark (only 4 away!) so as a thank you for all of your support, I will be giving away this little snugglebug baby (complete with sleeping bag suit) to one lucky liker. The winner will be chosen at random (by random.org) and will also receive VIP status with Monkey Hugs and Snugglebugs (see the notes section here for what that means). The competition will commence as soon as we hit 200 likers (I will announce when you can start commenting) and I will give everyone 2 days to enter. The lucky winner will then be drawn and announced here on my blog (due to facebook rules). edit - I have removed the requirement to become a follower of the blog (step 1) because I know that some people have been having issues with that step. For those of you who have already completed that step, thank you, but now as long as you are a liker on facebook and comment both on the blog AND the picture on facebook, you will be included. Make sure to leave your name on your comment so I can count you! This give-away is in NO WAY sponsored, endorsed or administered by, or associated with, Facebook. all the best for 200 likers !! 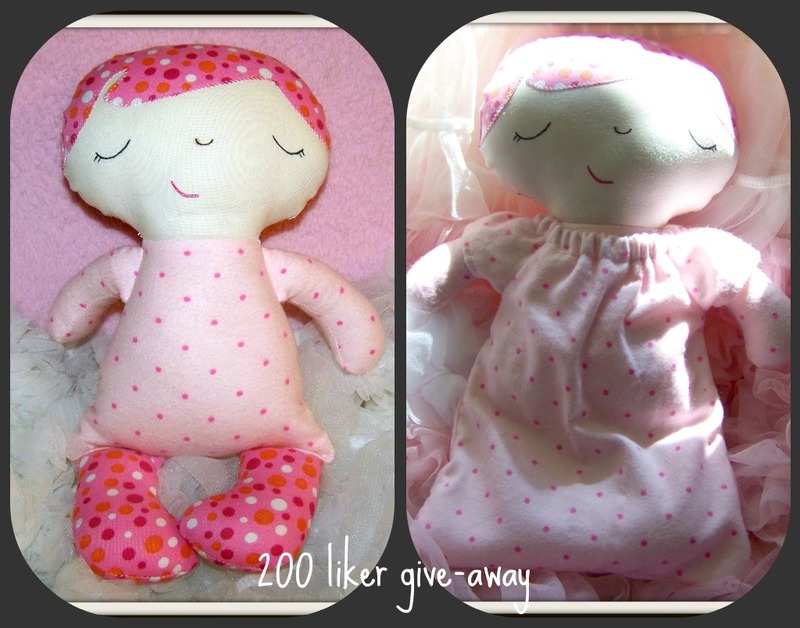 heres to 200 more.. well deserved, your dolls are stunning!! hi sam it's lianne penfold - would love to win her to have a pair! too cute! love love love your beautiful dolls. only wish i was as talented. you make me want to learn how to sew. might just join a sewing class in the near future. Sarah Hawkins here:) Congratulations again and I can't wait to see your future creations and hopefully order one very soon! Congrats on 200. That is a very pretty doll. Kirste McDonald loves your babies! Nicole White - Love your little dollies and sugarbabies!! They are just gorgeous! I know my little girl would be very lucky to have one of these in her life! Congrats on reaching 200!! Kylie Burath - Lovely dolls you make, so beautiful! I would love to win one for my little girls to share! Hi they are all beautiful - well done! Just gorgeous dolls, so soft and adorable looking. My facebook name Tallanya Morley!